He explains that with so many regions and so many different religions (each with their own cooking practices), there is no one answer to that question. 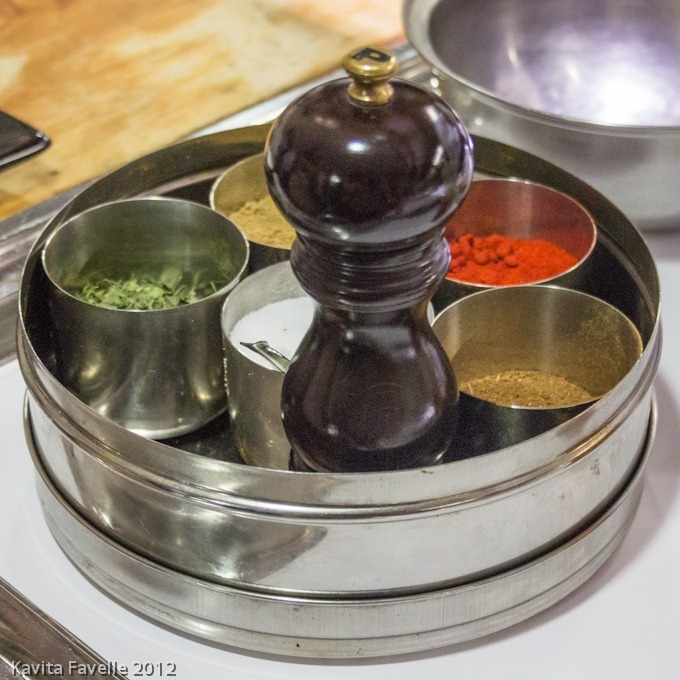 India, much like England, has absorbed so many culinary influences and ingredients over time. 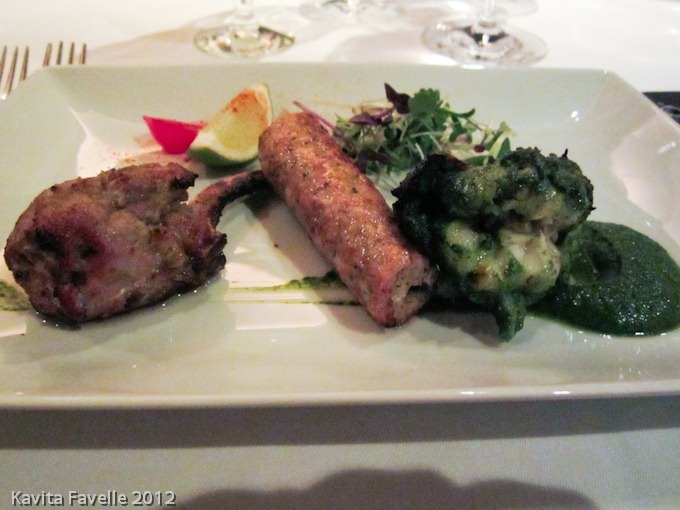 Take, for example, that “quintessentially Indian dish, tandoori chicken … the mighty tandoor doesn’t belong to India, it belongs to the Persians!” Chilli, an ingredient often considered intrinsic to Indian cooking, was incorporated only a few hundred years ago; “before that, we had pepper“. And “omelettes… we had eggs but not omelettes“, now popular and everyday. 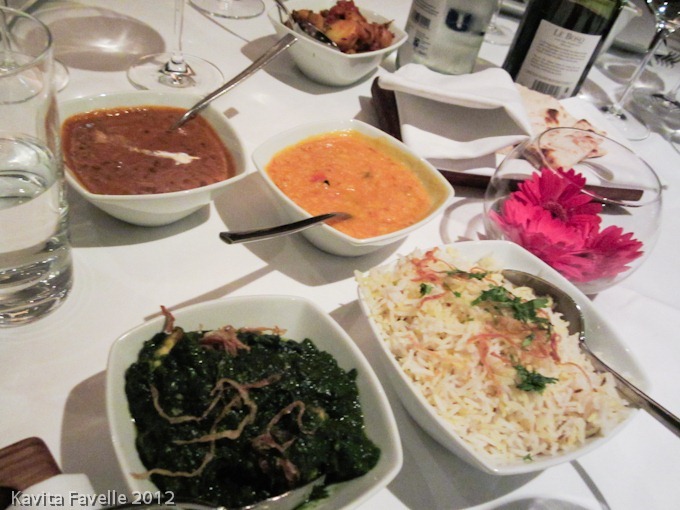 “When any cuisine is taken to another country it changes“, he states, moving on to talk about Indian food here in the UK. 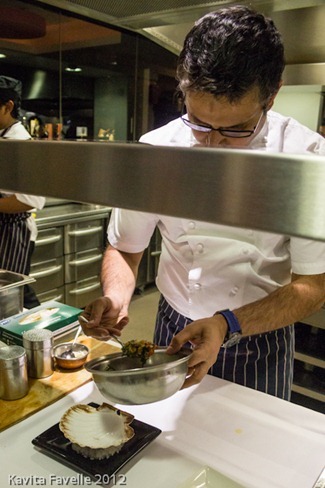 He tells us about how he cooks Indian food in the UK. Presenting his own modern Indian cuisine, he uses local ingredients as far as possible, and follows the local seasons. “Whatever comes, it’s on our menu, that’s how it is“, he says, making it all sound so simple. We are talking in the kitchen of Benares in London’s Mayfair, Atul Kochhar’s Michelin starred Indian restaurant which opened nearly 10 years ago and has been lauded ever since. 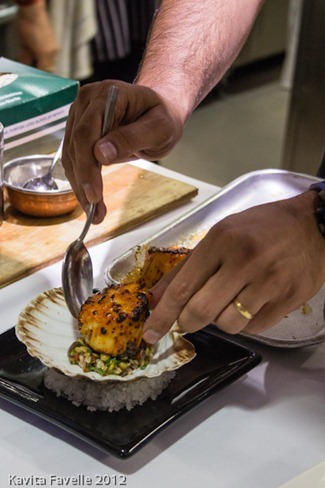 As he talks, Kochhar demonstrates a couple of dishes from his current seasonal menu – a tandoori scallop served over a lentil salad and crispy soft shell crab with crab salad and saffron mayonnaise. Working quickly, he talks us through each step, with tips along the way. Ginger garlic paste is always made fresh; he says of the supermarket ready made pastes that he doesn’t know what they might add to keep them fresh. 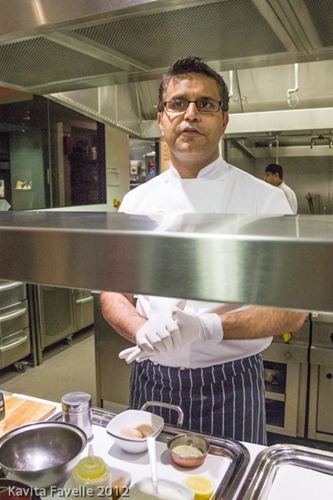 He uses mustard oil in his cooking, though it’s often labelled for external use only when sold in the UK. For those who prefer not to use it, he advises substituting Dijon mustard or any good mustard paste. For his lentil salad, he likes a mix of channa dal and urad dal. He laughs when he tells us that he always salts the lentils during cooking, as many European chefs recommend against this, insisting the lentils will become tough. “In India, we would never cook them without salt as lentils pick up salt in cooking only“. I can attest that his lentils certainly aren’t tough and are perfectly seasoned. Like my mum’s, his tandoori marinades are never bright red. When tandoori meats first gained popularity in the UK, kashmiri chillies, which give a distinctive red colour, were easy to get. 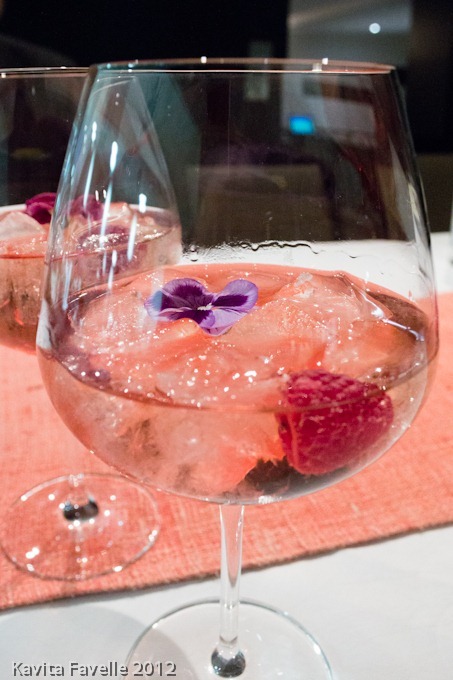 Now they are more expensive, they are used more rarely, and many UK Indian restaurants took to adding cochineal to achieve the expected red colour. He doesn’t, of course! As he mixes the marinade he explains that, since he’s applying it to fish, 10 minutes will be plenty of time, though meat needs longer. Moving on to the soft shell crab results in a discussion on the crabs themselves. 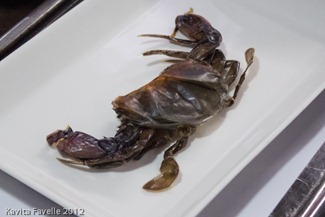 Whilst species of crabs that are known as soft shell species are not found in UK waters, our local species are soft enough to be cooked in the same way if we happen to catch them within two weeks of them moulting their shells. Otherwise, it’s a case of buying the soft shell breeds from the Far East or Maryland, USA. 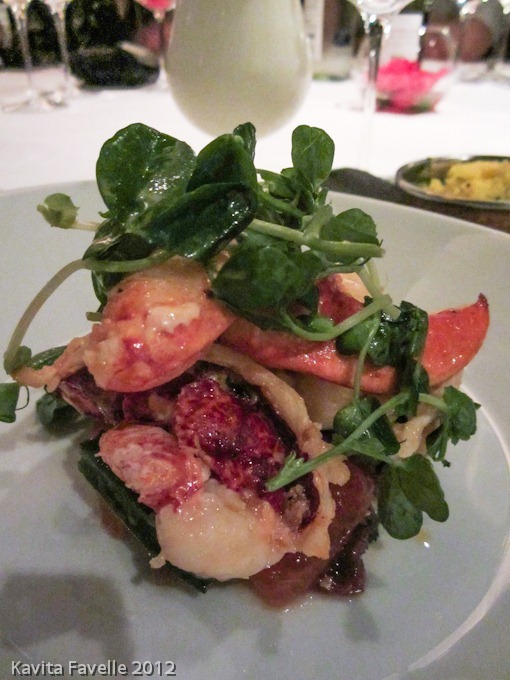 He tells us, with some wonder in his voice, about a recent visit to a fish market, where he picked up a lobster that had just shed its shell: “It’s skin was really squeaky, slimy.” Soft shell lobster, anyone? 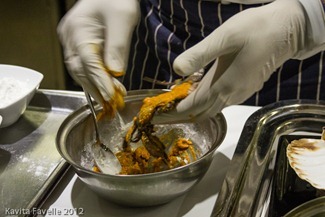 As each dish is finished, spoons at the ready we dive in. Amidst appreciative noises, our small group quickly polishes off each dish, throwing extra questions in Kochhar’s direction as we do. 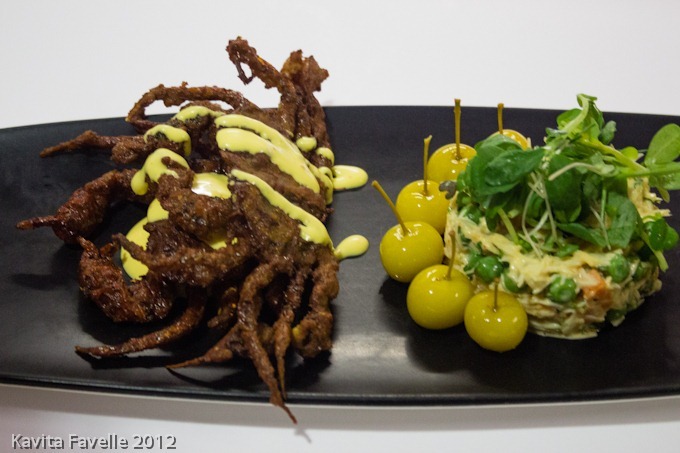 We are intrigued by the tiny yellow fruits served with the crab; they are the size and shape of cherries, but we’re amazed to learn they are crab apples, preserved whole to be used as a delicious garnish for this dish. 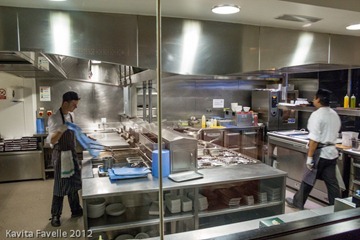 We reluctantly leave the kitchen to enjoy dinner from the a la carte menu. Our group is slightly larger than planned, so we eat in the main dining room, instead of the chef’s table as originally intended. A shame, as the view through the large glass window is compelling viewing. 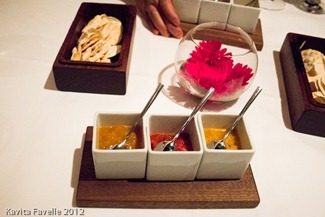 Mini poppadoms are served with pineapple, tomato and ginger chutneys. 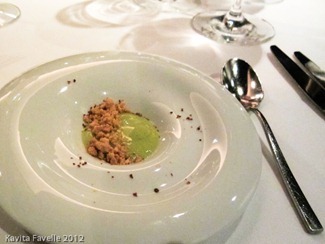 The amuse bouche is a Mango Pana, usually a drink but here served as a thicker liquid. It’s made with raw green mango, cumin and jaggery, and had crunchy toasted peanuts sprinkled on top. 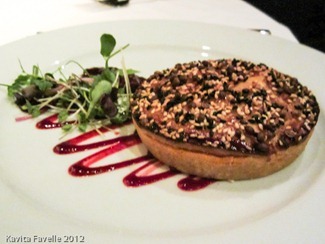 Tart, sweet, crunchy, this is an intriguing couple of mouthfuls. For my starter, I choose the Tandoori Ratan, featuring a fennel lamb chop, a chicken seekh kebab and a basil king prawn. 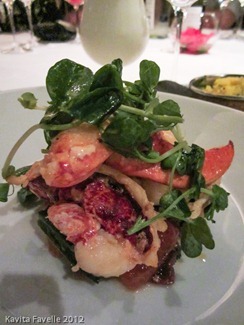 All beautifully cooked, with well balanced flavours, soft in texture and a nice selection, served together. Dithering over the mains, I finally settle on the Konju Moilee. 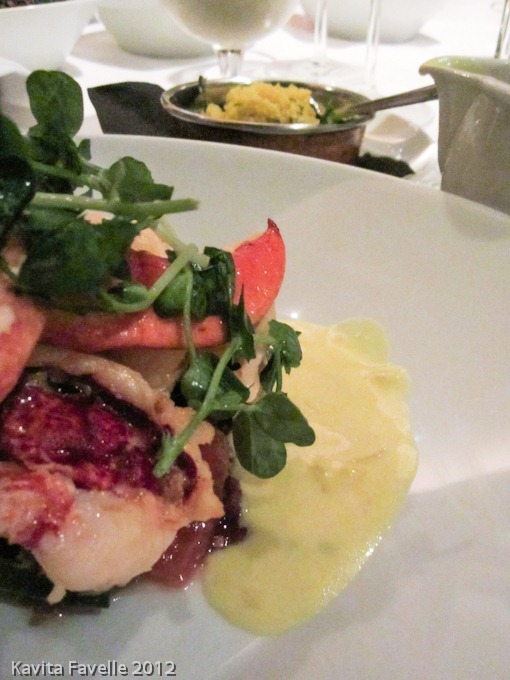 What arrives is a generous serving of Scottish lobster over okra and mango, with a jug of rich moilee sauce and a side dish of lemon couscous. With the exception of the couscous, I love all of it, even the okra which I’m not usually so keen on. 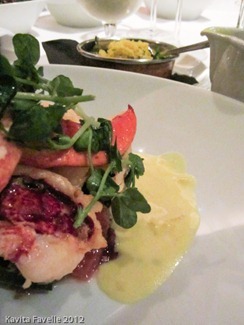 The flavours in the coconut-based sauce are wonderful, robust and yet don’t overpower the lobster. A selection of sides are ordered for the table; all are good. Of special note are the Palak Paneer, Aloo Jeera, yellow dal, red dal and several different breads. 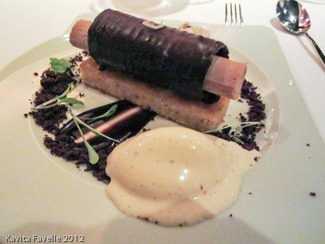 For my dessert, I can’t resist the Chocolate Peanut Butter Tube, Jaggery Cake, Cumin Marshmallow and Sugar Cane Ice-Cream. More than the other courses, this really shows Kochhar’s commitment to bringing modern techniques and ideas to his cooking, combining Indian flavours and ingredients with European ones. I love the peanut butter filling, though the chocolate tube shell is a little hard to break into. Likewise, the jaggery cake I find a little tough. I do enjoy the cumin marshmallow, weird though it is and like the oreo cookie “soil” and sugar cane ice-cream. Others in the group are just as impressed with their choices which include the Chicken Tikka Pie, beautifully presented with its topping of black and white sesame seeds, Mackerel Ki Kathi, mackerel cooked Kolkata style and served on a crispy naan bread with peppers and egg, Tawa Gosht Aur Suhnari Kahsta, a lamb dish served with purple potatoes so delicious they almost bring tears to the eyes of the dish’s owner and Samudri Khazana Do Pyazaa, a seafood dish featuring king prawns almost as large as the lobsters! Service, as you’d expect in a restaurant of this calibre, is knowledgeable and helpful and the pace of the meal well judged. Unlike some other high-end restaurants, I’m glad we are not constrained by the kind of hushed atmosphere that stifles friendly chatter at the table, both ours and many others. 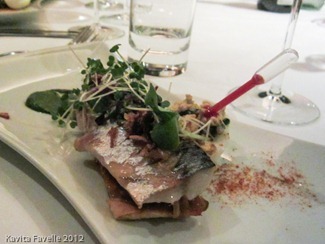 Kavey Eats attended the cookery workshop and meal as a guest of Atul Kochhar and Benares restaurant. 8 Comments to "Eating with Atul: Atul Kochhar at Benares"
A lovely review Kav, he seems like a man after my own heart :-)! This is so true, our food has been influenced by everyone that came to India over the centuries, including the British. Absolutely! It has to make do with what is available locally and what the people of it’s new home like and dislike. Otherwise it dies. True, if the change is done in a good way, it enhances an Indian favourite or invents a new dish. With so much international travel in the world, cuisines of different countries are picked up by travellers and then added/adapted to suit their own cooking. Take for example a simple thing like a salad dressing; I mix and match so many things to it from so many different countries, which I had never even heard of while growing up in India. Sounds like a gem of a place. Yeah I liked it a lot. Not only the great food but also that the vibe wasn’t a hushed one like some top places, that make you feel you’re in a shrine! Sounds like a great evening. Great photos, Kavey! Was lovely and thank you! A lovely review Kavey, and great photos, so glad you are publishing them larger than before. Thanks Helly, yes I’ve been using larger ones a lot since I moved to new blog design in February. I stick to smaller ones only if I’m including a few more images and they can be enlarged by clicking. Cumin marshmallows, let me know how you get on! !